The weekly BBC Radio 3 Lunchtime concerts at London's Wigmore Hall feature much-loved international artists and young, up-and-coming performers from the BBC New Generations scheme. The many portraits decorating the Green Room at Wigmore remind us that practically all the great soloists in the business have performed here at some point in their career. Yet lunch with Khatia Buniatishvili is not an easy thing. The program proposed by the Georgian pianist on February 11 for a sold-out Wigmore was anything but a rush lunch at your nearest fast-food joint. For its mere 60 minutes it was quite a copious meal, food for thought as it were, taking a while to digest but eventually paying off. In fact, with playing this focused, relentlessly intense and passionate, insightful and quite stunningly virtuosic to boast, it was sheer delight. We know from previous concerts and her latest CD that Buniatishvili can make perfect sense of Chopin's 2nd Sonata and turn it into a dizzying, at times devastating experience by her grasp of structure and considerate interpretation, playing effortlessly with contrasts in tempo, dynamics and minor-major keys. The flashes of demonstrativeness that some hear in her playing (or as word goes now: "erratic"), especially in her Chopin, never struck me as such, but rather as a consistent reflection on the often contrasting or clashing emotions in so much of this composer's music. But then, as said, Khatia Buniatishvili never offers an easy ride. Here again, with her impressive sonority occasionally flawed by a booming left hand amplified by the open acoustics of the Wigmore Hall, the complex sometimes anguished imagery of Chopin's inspiration left one gasping for air. She found plenty of irony in the Scherzo, but also a profoundly human side in the trio of that movement. In the Presto finale a man of not even 30 created a baffling whirl of notes that was so ahead of its time he would never create anything like it again. In Buniatishvili's hands it became a frightening wind of terror linked to her subtly shaped account of the shattering Marche funèbre. The two Chopin Scherzos that followed, the 2nd and 3rd, continued in this feverish mood. Yet they were similarly illuminated by Buniatishvili's command of structure. The ruminative quality of her playing in the trio in the 2nd Scherzo providing respite for the stormy outer sections, or the startlingly handled modulation before the piu lento passage in the 3rd were just a couple of examples of her insightful approach, which eventually contributes to present these imaginative pieces on a more human scale. The recital was concluded with a take-home performance of Maurice Ravel's La Valse. Albeit more often heard in its version for two pianos on which the famous orchestral transcription was based, the piano solo score of La Valse is no less fascinating. The feeling of anxiety and fatalism of Ravel's "apotheosis of the Viennese waltz" is even more present when heard on a piano than when played by the full orchestra. 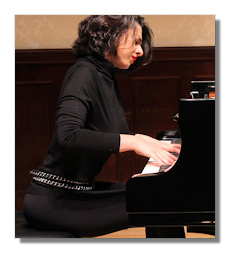 A dauntless Buniatishvili recreated Ravel's dazzling array of tempo and key changes, and assuredly knit the complex polyphonic layering into two immense crescendo's. There were moments of sheer beauty too, as in the Un peu plus modéré section. The final climactic turmoil, though, developing from the Un peu plus vif en accelérant notation onwards (which was taken for more than it was) was a staggering moment, tremendously exciting, a dropdead stamina test skirting the limits of what is physically possible with just two hands. Yet even the heaviest note-saturated passages rang without any loss of articulation and transparency. This was downright phenomenal playing indeed. Buniatishvili returned for an encore, adding to the excitement and enthusiasm with her full-throttle rendition of the Precipîtato from Prokofiev's 7th Sonata. One sure doesn't have lunch like this every day!